This month’s cover photo, by Rich LaBella, is dedicated to Rob Roden of East Hampton, NY founder of The Captain’s Guide, who crossed the bar in August. 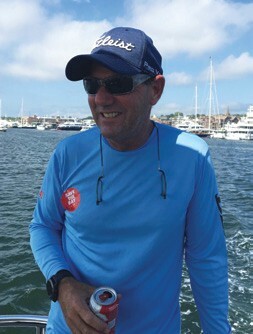 Rob also founded the Antigua and Barbuda Hamptons Challenge, which is featured on the cover. Rob was very proud that this event had the largest prize of any amateur sailing event on the East Coast, and likely anywhere at all. The winning team earns free flights, accommodations and a boat to race at Antigua Sailing Week in the spring. Sadly, Rob died at his sister’s home in Hampton Bays just a couple of weeks before the event. I guess it’s natural to worry about the lack of growth or progress in anything we are passionate about. There is certainly no lack of hand wringing about how hard it is getting kids involved in sailing and keeping them engaged. Almost every day in Scuttlebutt, there seems to be a success story juxtaposed with a lament that we are not doing it right. 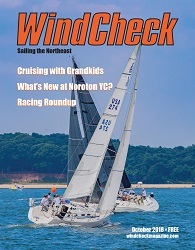 As of this issue, the helm at WindCheck is in the sure hands of Ben Cesare, an affable and accomplished sailor who acquired the magazine last month from co-founders Anne Hannan and Christopher Gill, who launched ‘The Magazine by and for Long Island Sound Sailors’ in 2002.